Greetings from UW-Green Bay, home of “Connecting learning to life,” where autumn is bright and radiant even well into November. Bright with positives. Your University has enjoyed a quite-remarkable run recently, with excellent new facilities coming on line, best-in-Wisconsin awards for faculty, and impressive additions in programming. We continue to build on our reputation as a top-tier regional institution. This issue of Inside UW-Green Bay documents that success. It also includes our annual honor roll of philanthropic support. We think it’s a natural pairing. Great news and community involvement go hand-in-hand at UW-Green Bay. The connection dates to Sept. 2, 1965, when we were little more than a name on a piece of paper. That’s when Gov. Warren Knowles signed legislation promising a University of Wisconsin campus for the region and bringing joy to prospective students and the business and civic leaders who campaigned so hard to make it all possible. We intend to celebrate the 40th anniversary of their achievement  the founding of UW-Green Bay  next fall, perhaps with a reunion of community friends and current and former faculty, staff and students. It’s a given that Founding Chancellor Edward Weidner and his wife, Marge, will be prominent. We have a perfect spot for any gathering, too, in the University Union’s 1965 Room, where the signing pen and a copy of the act creating Green Bay’s University of Wisconsin are framed and on permanent display. Many of that era’s key advocates, of course, have long since passed away  Rudy Small, L.G. Wood, and state Sen. Robert Warren among them  and we lost two others, Jake Rose and John Somerville, just this past year. They will be with us in spirit. I think the families and successors of those citizen founders can be immensely proud of where their University stands today. We all can. Read in these pages about the professional achievements and public-service activities of truly exceptional faculty, staff and alumni. Know that much of it is possible only through private support and entrepreneurial know-how. Scan the roster of private donors to the Founders Association and our other constituency groups, see your own name or those of neighbors and acquaintances among the list of thousands, and recognize your role in carrying forward the original grass-roots effort that brought the University of Wisconsin to Green Bay in the first place. UW-Green Bay turns 40 in 2005. We’re fit, vibrant and forward-looking, due in no small measure to the company we keep, namely, you. In the span of a single week earlier this fall, UW-Green Bay stars swept up major honors in a fashion reminiscent of Lord of the Rings at Oscar time: one after another.  Prof. Regan Gurung, recognized with the campus teaching award and an invitation to help lead a statewide effort to promote faculty development. The rapid-fire succession of honors was coincidence; the receipt by UW-Green Bay faculty members was anything but. 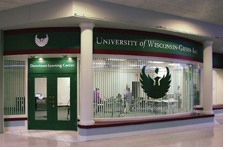 UW-Green Bay has long been known for its devotion to excellence in undergraduate instruction. With new programs only reinforcing that priority, and with the buy-in of both faculty and support staff, the real winners will be students and the larger community, for many years to come. When UW-Green Bay Prof. Denise Scheberle received the UW Regents Teaching Excellence Award, it was a tremendous honor, an affirmation of what her students and colleagues have known all along: Her commitment to teaching far exceeds measure. Scheberle’s gentle presence and humble persona might seem incongruous, somehow, with descriptions of her powerful impact and fierce passion for teaching. But one need only observe one of her classes (left), or talk to one of her students, or simply have a conversation with Scheberle herself, to conclude that she pours her soul into her profession. She is a fan of the Parker Palmer book The Courage to Teach and its message that in order to be a good teacher, it’s important to be a genuine person, and be true to oneself. Scheberle teaches in an understated manner, carefully planning what the outcome of her class should be, and then delivering in a way that those outcomes are met systematically and successfully. A class project in nonprofit management is a perfect example. She encouraged her students to engage in an activity that could raise funds for nonprofit agencies. The result was the Steps to Make a Difference Walk, which raised more than $10,000 this year for local agencies. It’s a teaching philosophy that has evolved over time and with a critical look at her own practices. She consults her students regularly as to what she should "keep" and what she should "trashcan." During discussions she asks, "what's the muddiest point?" or "what's the most illuminating point?" Modestly, she deflects the attention that comes with the prestigious honor. Teaching awards are nothing new for Scheberle. UW System recognition as state teacher of the year for 2004 is a logical progression. She is a past recipient of the UW-Green Bay Founders Association Award for Excellence in Teaching, was selected for a Faculty Development Council “Teaching at Its Best” award, and has four times won her department’s teaching award. All of this since 1992, when she joined the UW-Green Bay faculty to teach courses in public and nonprofit management, American government, public administration and environmental law. She helped develop a UW-Green Bay Teaching Scholars program for new faculty members, an annual on-campus teaching conference and a yearly Academic Excellence Symposium to spotlight student achievement. Scheberle is also an active scholar with a long list of published papers and conference presentations. Her book, Federalism and Environmental Policy: Trust and the Politics of Policy Implementation, is in its second edition. She earned her Ph.D. in political science from Colorado State University. I have a deep appreciation for the power of those "ah-ha" moments when students and teacher are riveted to an event, a particularly telling comment, or an astute question. I ask students to risk a good deal as they shift from passive learning to co-production in the classroom. We use imagination, we treat each other with respect, and we grapple tough issues. Students continue to surprise me with the depths of their passion and understanding. You see, they have the power to change me, just as I am once again humbled by the power of teaching and the great honor of being a teacher. Sharing the power of poetry. Engaging audiences young and old. Encouraging others to participate. Taking the message "on the road." That's the job description for the position of Wisconsin Poet Laureate to which Governor Jim Doyle named Prof. Denise Sweet early in September. But it's pretty much what Sweet has been doing all along. "I'm doing all of those things anyway, and now the governor has named it," says Sweet. "For the next four years, it will be my job to share my love for poetry with the citizens of Wisconsin. Does it get any better than that?" Indeed Sweet's resume neatly fits the job: writing poetry and giving readings, teaching university students, leading writer's workshops for young and old, sharing her talents as a poet-in-residence, engaging in a broad array of community activities. An Anishinaabe (Ojibwe) enrolled at White Earth, she has worked with traditional and contemporary educators, especially in the Great Lakes Region and the Southwest. Among Sweet's present community projects is The River of Words in which she and a naturalist work with fourth- and fifth-graders over the course of a school year. The naturalist teaches about watersheds and water quality; Sweet's part of the project will help the children write about it. Calling community education her "first love," Sweet says, "Whenever I can, I like to do the kind of community work that has more than one result." Sweet realized in seventh grade that she was a poet. Deeply troubled by the assassination of Dr. Martin Luther King Jr., she wrote her first poem about that event. A teacher sent the poem  without Sweet's knowledge  to an educational program on Wisconsin Public Radio where it was read on-air. It also was printed in the local newspaper. "I was embarrassed," says Sweet, but acknowledges that it also fed a desire for attention for a skill that came easily to her. Writing poetry is a solitary endeavor ("When I'm staring out the window, I am actually writing poetry"), but when Sweet reads her work, the experience is one of connecting with the listeners. "I feel very alive and I feel the power of the words," says Sweet. "My voice lifts me up and I have to think it lifts the audience up, too." She sometimes reads a particular poem because she feels someone in the audience needs it. Though her poetry is introspective and based on her own experience, Sweet intends the end result to be inclusive. "If my poetry does not allow everyone to be considered, I cannot move the audience," she says. "They can respond because they have been through the same thing or because they have compassion for those who have." David Dettman represents the many UW-Green Bay staff members whose position descriptions might not say “teacher” but whose actions speak louder than job titles. Reference librarian and head of library instruction at UW-Green Bay, Dettman received this year’s Founders Association Award for Excellence in Academic Support. He guides students and other patrons down the path of discovery using the Cofrin Library’s on-site resources and Internet access to other collections and databases around the world. He assists entire classes, leads small-group workshops and works one-on-one with individuals. Dettman says he feels energized every time he begins an instructional session or sits down with a patron. A colleague who recommended him for the Founders Award described him as being “relentless and creative” in finding information students and faculty need. Prof. Regan Gurung, winner of the 2004 UW-Green Bay Founders Association award for Excellence in Teaching, is an active scholar of teaching and learning. Gurung was a member of the first “class” of UW-Green Bay Teaching Scholars  a program for the University’s new and promising teachers  in 2000-2001. The following year, he was selected to be a Wisconsin Teaching Fellow, a yearlong program for outstanding new faculty sponsored by the UW System. Gurung’s study of teaching predates his arrival at UW-Green Bay. Even before joining the University in 1999, he was active in the national Society for the Teaching of Psychology. He continues the involvement and has been program chairperson for three of the organization’s national conferences. Gurung credits his interest in the scholarship of teaching to his discipline  psychology. “It comes directly from using the scientific method in teaching,” he says, explaining that it’s the method psychologists use. Translated to teaching, it means that psychologists apply the same strategies to teaching that they employ in their research. Gurung observes that his interest in learning about teaching has grown since coming to UW-Green Bay. “It has been fostered by how much we focus on teaching here,” he notes. UW-Green Bay’s Instructional Development Council has recognized Gurung’s teaching several times. He has received the Council’s Featured Faculty Award, which showcases excellent teaching, and twice has won Creative Approaches to Teaching Awards, which single out particular teaching strategies. He also has sought and won Teaching Enhancement Grants. This fall, Gurung was appointed to serve a three-year term on the statewide, UW System council promoting faculty development. On campus, he was named co-director with Prof. Denise Scheberle of the UW-Green Bay Teaching Scholars Program, replacing Prof. Fergus Hughes who became interim dean of liberal arts and sciences. Prof. Fergus Hughes, who literally has taught thousands of students and devoted countless hours to institutional service and in-service training in the larger community, while maintaining an active career as a scholar, was named UW-Green Bay’s interim dean of Liberal Arts and Sciences in June. He will serve a two-year term as dean. Hughes was singled out for his teaching early on during his UW-Green Bay career, which began in 1972. He won the 1978 Founders Association Award for Excellence in Teaching. Ten years later, he was selected to be the UW-Green Bay faculty member featured in a special issue of the UW System publication, “Wisconsin Ideas,” dedicated to recognizing outstanding teaching. 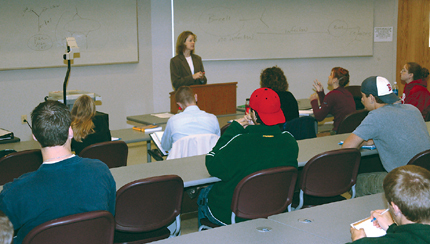 In 2001, Hughes was the first from UW-Green Bay selected to participate in a new Teaching Scholars Program sponsored by the UW System Office of Professional and Instructional Development (OPID). His concern with teaching has extended to fostering good teaching across campus. He, along with Prof. Denise Scheberle, co-founded the UW-Green Bay Teaching Scholars Program in 1999 to give the University’s newest faculty members an opportunity to study their craft. The two successfully won a grant from OPID in order to launch the program. This fall, the program expanded with a pilot Teaching Scholars II, an advanced program for tenured faculty. The University of Wisconsin-Green Bay community will reflect on four decades of change next fall when the campus celebrates the 40th anniversary of its founding. Objects looming large in that rearview mirror will be events of this current semester. The University looks different  much different  than it did only six months ago. Laboratories? 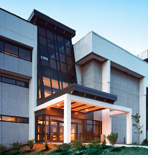 The Laboratory Sciences Building, totally rebuilt at a cost of $15 million, repositions science education on the leading edge, once again. On-campus housing? A newly opened apartment building pushes total capacity to 2,000 students, a milestone in the journey from commuter school to a more residential campus. Outreach to the community? The University makes a key commitment to the future of downtown Green Bay by locating the new Downtown Learning Center in Washington Commons, the former Port Plaza Mall. Fresh facets and facilities are visible in nearly every area of college life. The Weidner Center’s Chihuly Chandelier ranks with the most important acquisitions, ever, in the local fine arts community. The natural treasure that is the Cofrin Memorial Arboretum continues to grow. Music students enjoy all-new practice space in the Studio Arts Building. New UW System President Kevin Reilly, who succeeded longtime leader Katharine Lyall in September, surveyed the changes during his first official visit. One of UW-Green Bay’s first buildings has been made new again, for a new generation. The fall semester opened with a ribbon cutting at the renovated and expanded Laboratory Sciences Building. A $15 million state investment transformed the 35-year-old facility into a showplace for science education. The renovated building houses teaching laboratories for biology, chemistry, earth science, ecology, food science, general science, physics, and soils and water science. With room for 24 students, each lab will be 50 percent larger than the old labs. Human Biology Associate Prof. Angela Bauer-Dantoin, who has research interests in cell biology, endocrinology and fertility, says training on high-tech laboratory equipment helps students “be at the top of their game” when they enter the workforce. Wood Hall meant business or perhaps social sciences. Lab Sciences meant, well, lab sciences. Studio Arts? Most likely music, art or humanities. Recent completion of the University’s newest apartment-style residence hall does more than add 122 beds. It achieves a longstanding goal and pushes past a symbolic barrier, with 40 percent of all students now living on campus. Experts say 40 percent can be a tipping point for institutions in terms of lively atmospheres, weekend activities and engaged student bodies. Although most individuals will migrate off campus by senior year, friendships and a stronger connection to campus will survive. Today, approximately three-quarters of UW-Green Bay’s 1,000 new freshmen reside on campus. In total, 2,000 students live in two dozen apartment and residence hall buildings. Tom Haevers Hall and its student activity room were dedicated in September for Haevers, the founding director of the Residence Life program, and Vice Chancellor for Business and Finance Tom Maki. The honors came at the urging of the nonprofit board responsible for development of the housing complex. UW-Green Bay recognized one of its pioneering faculty members this year with formal dedication of the 20-acre Paul Sager Tract. The land occupies a grassy hillside north of the Phoenix soccer field, just off Champeau Road overlooking the campus and bay. It was acquired with private gifts for preservation as a natural area within the boundaries of the Cofrin Memorial Arboretum. Sager, a biologist, taught in UW-Green Bay’s Natural and Applied Sciences program from 1967 to 1999. He was the longest-serving director of the Arboretum. Sparkling reviews have greeted a world-class addition to the permanent art collection of the University of Wisconsin-Green Bay’s Weidner Center for the Performing Arts. The Weidner Center Chandelier, created by internationally renowned Seattle artist Dale Chihuly, has fascinated visitors and set cameras flashing since its September unveiling in the Weid-ner’s Grand Foyer. The work was commissioned by family members and friends of the late philanthropist and community leader Josephine Buchanan Lenfestey, in tribute to her generous spirit. The piece consists of more than 450 individual hand-blown pieces of glass configured onto a steel armature. It measures 12 feet long by 7 feet wide at its widest point. The question everyone asks: How do you dust this spectacular masterpiece? The answer: with an extension, a special attachment and great care. The new Downtown Learning Center at Washington Commons is being praised as a symbol of UW-Green Bay’s commitment to help revitalize Green Bay’s central city. The 2,600-square-foot center includes a classroom seating up to 48 students, a conference room and support space. Early bookings have included professional-development workshops offered by the University’s Office of Outreach and Extension. Topics have ranged from leadership development, emergency management, and human resource issues to business and nonprofit management. University officials say the center strengthens connections between campus and community, and emphasizes the University’s commitment to “Connecting learning to life.” UW-Green Bay has also been supportive of downtown initiatives including H.Y.P.E. for young professionals, an entrepreneur’s conference, and site selection for the University’s new Paper Sciences Technology Transfer Center. With remodeling of the Studio Arts Building just about complete, UW-Green Bay can boast of having the most (11) specialized music practice units of any installation in Wisconsin. They’re called Wenger Practice Units, rooms pre-fabricated to be spacious, acoustic and efficient, with floor to ceiling windows. All of the units, except for one, are located on the first floor of the building near faculty offices. They replace a classroom, storage area, the band and choral library, and a long-obsolete marching band equipment room. “As our alumni could attest, comfortable and acoustically tight don’t usually go hand-in-hand,” says Kevin Collins, UW-Green Bay director of bands. “These rooms provide excellent acoustical ambience, sound reflection, absorption and insulation. When you’re in a room, it’s QUIET and you can really focus on music making.” Collins says faculty and students look forward to reverberation technology that will be added in January, allowing the acoustical environment to be modified with the push of a button. “We’ll be able to mimic the acoustics of a church or auditorium or virtually any situation our students will perform in,” Collins says. “Everything has been designed to positively impact student learning.” The new technology will signal completion of an $860,000 project that addressed acoustical deficiencies and humidity-control issues in the building. Also added were sound-attenuation panels for the percussion rooms and two piano rooms in the large ensemble room on the second floor. UW System President Kevin Reilly was the keynote speaker for the annual faculty-staff convocation to open the 2004­05 academic year. He shared praise for UW-Green Bay, its special mission and people. He said he supports the institution’s emphasis on problem-solving and regional issues, and is inclined to favor plans extending the University’s ability to serve the region. He also shared an unofficial “mission statement” for his term as president of the statewide system.